Going out for fishing can be very enjoyable for both family and friends. You can spend countless hours on the shore or in a boat with your fishing gear waiting for something to bite. The whole process of fishing can be very relaxing. In most areas there are certain catch and release rules that state you have to release the fish you catch if they are of a particular species or do not fall within a certain size criteria. If you want to unhook a fish without hurting it then you can follow some easy techniques to help you out. When trying to unhook a fish without hurting it, be as quick as possible and do not waste time. Try to unhook the fish as soon as possible as the fish might have used up their entire energy while struggling or putting up a fight in the water. 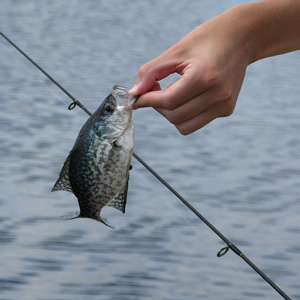 As soon as you pull the fish out of the water, quickly check to see if it is shallow or deep hooked. Shallow hooked means that the hook is sitting in the jaw or mouth of the fish as deep hooked means that the hook is further down the throat or towards the stomach and gills. By understanding the difference between the two types can help you unhook a fish without hurting it. By using different tackle like barbless hooks you can significantly reduce the level of injury to the fish which you catch. There are different types of hooks that are now readily available that are effective for fishing and easy to remove without harming the fish that you catch. Hooks which are single pronged can be effective and reduce the amount of injury to the fish. It is important that if you want to unhook a fish without hurting it then pull the fish out of the water using your hands or a proper net. Do not use the fishing line as this can put more pressure on the hook which is imbedded in the fish. By using the net or your hands to pull the fish out of the water and reduce the level of damage you might cause to the fish. Once the fish is out of the water it is important to hold the fish gently but firmly without putting pressure on the gills. Use your hands or some pliers to pull the hook gently out of the mouth of the fish to avoid doing any further damage. Once it is out you can put the fish gently back in to the water.